I hate eyedrops anyway so this made me cringe… and laugh of course. Keep it up, Chris! Something comparable to this happened to me. I was cutting and preparing peppers when an unlucky squirt got a tiny droplet on my contact, in my eye. It wasn’t bad, but it was annoying, so I washed my hands and went into the bathroom to try to remove the contact. Little did I know that when you’ve been cutting peppers for 20 minutes, normal handsoap and washing practices are not quite enough to rid your hands completely of all pepper oil. I was floored for 10 minutes, unable to do anything but writhe and moan unintelligibly. Eirikr, You’ve just brightened my day. Hehehe! I can’t stand Eyedrops though. back in high school, we had to disect a fetal pig. When I was cutting open the stomach, the fromaldahide (or however you spell that) squirted out and into my eye. A few minutes later the lunch bell rang. I saved five bucks that day…. biff likes to put the wrong things next to each other doesn’t he? Erikir, I can sympathize with your writhing and moaning unintelligibly. It took a while before I finally worked up the nerve to bite the bullet while I took them out. >. You know those mouthwash bottles from the hotel? Well they have this aluminum wrapping on the hole, and this sucker did NOT want to come out. The being very Biff like I looked at the mouth wash bottle squishing it very hard. Next 5 seconds the seal finally broke, over half of the stuff went in to my eye. Let’s say for a minute I would go blind. Luckily it was easy to wash the stuff out, but hard to get the feeling out. Good news, my eye had fresh breath that night. And if you don’t know what capsicum is…it’s what makes chilies hot. This is actually the first Biff I ever saw. It was in an ad on another site. oh man, This is easily my favourite Book of Biff Comic… EVER!!! When i used to where contacts about four-five years ago, I got some dirt in my eye. I went to the bathroom to get the eyedrops, but accidently grabbed the cleaner for my contacts. That stuff BURNS when put directly into your eyes. It probably made my vision a little worse, too. I no longer wear contacts, but that’s only because they’re annoying. well i dont plan on using lemon juice as eyedrops, but i did use taco sauce once. it was an accident. i was eating tacos in my room and had them on the bed while i sat in a chair next to the bed, and squeezed the packet. there was so much velocity apparently, that it splashed from the taco to my eyeball. i think it was in my good seeing eye too. dont know if that can beat spot knight though. i had the appearance of a pink eye fanatic. I can sympathize with Biff somewhat. I was in chemistry class in middle school and I was dumb enough to look directly above something I was boiling without wearing goggles. Hot boiling science juice burns like hell. 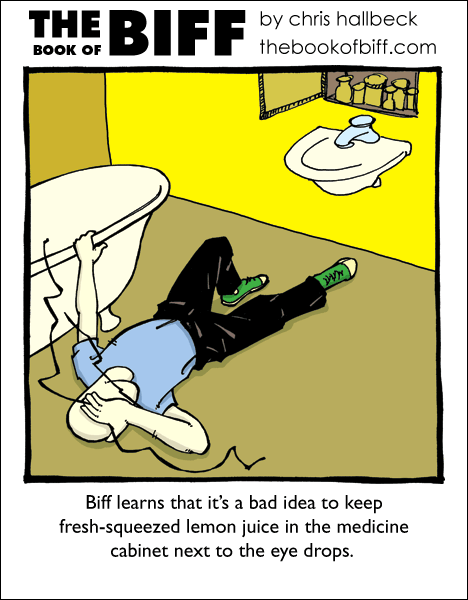 Normally Biff acts more passively when enduring the enormous pain he’s subject to with alarming frequency. Is he cringing because it hurts even more than a papercut, or does it hurt less, so he’s not paralyzed? I am currently sick and when my eyes began itching, not even my trusty eye drops could save me. I read this at work and just started laughing hysterically. People around me looked at me funny. Its amazing how much they stress saftey goggles in high school, and yet you people STILL manage it somehow… Im lucky I never got hurt like that, nor contacts… things touching my eyes scare me. according to these comments, half of you must have difficulty just seeing the comic…sheesh! Hot oils + certain body part = OWWW! I once used protien removing contact cleaner as an eye drop once, having not seen the label. You know, the stuff you’re only supposed to use a DROP of in with the saline overnight? Yeah. Have you ever been eating an orange and the juice squirts you in the eye. Man, I hate it when that happens! I once put TABASCO in my eye. After that I could have washed it away with lemon juice. so i eat the samosa and get everything on my hands then i have a drink and it splashes me in the eye, i instantly rub with my wasabi and jalapengno juice hands. Isn’t this a reincarnation of an older comic? “Hot boiling science juice burns like hell.” Great quote. Ouch! I got hot sauce in my eye once. I was eating my chicken wings too fast and it splashed into my left eye, I think.